The mountain is ablaze with blooming wildflowers and azaleas~ One Sunday when the vitality of spring was in its full glory, I visited a great walking trail. I arrived at the mountain village of Mochagol, where a song of spring poured shamelessly from my lips. No need to be self-conscious about people hearing me, as my song was dispersed by the gentle sound of the wind and harmlessly dashed against the foliage. 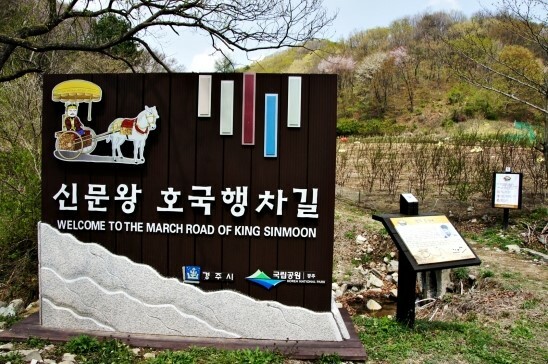 I am going to introduce one of Gyeongju’s fine walking trails, called “Sinmun Wang hoguk-haengcha-gil.” The English signage calls it “The March Road of King Sinmoon,” referring to the route of a royal procession in King Sinmun’s day, so here I will call it the ‘Royal Procession Route of King Sinmun,’ or just ‘Procession Route.’ Today it is a hiking course that traverses Mount Hamweolsan. 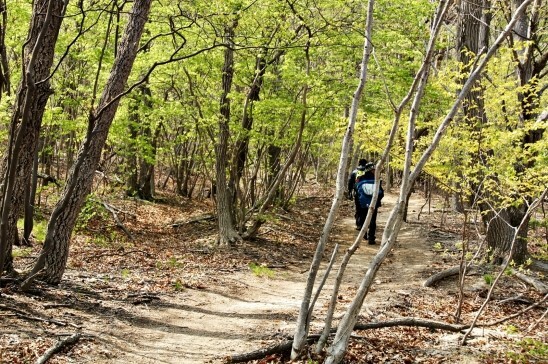 With its bright-green springtime hues, this forest trail is already a nice place to take a walk. But, what kinds of long-ago stories gave this wooded path its name? Let’s find out as we walk along the trail. 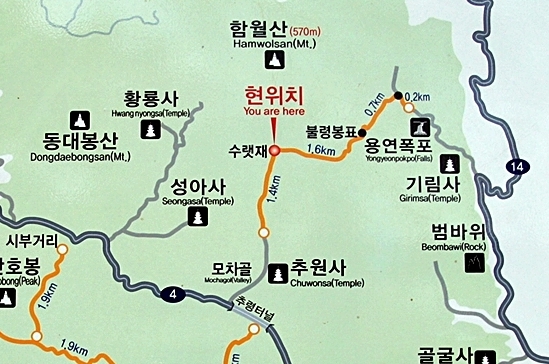 The Royal Procession Route of King Sinmun comprises a long journey, departing from Wolseong Fortress, the one-time site of a Silla palace, and continuing to the distant Underwater Tomb of King Munmu. 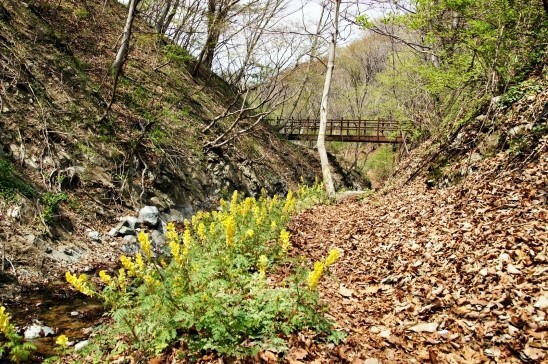 It was along this path that King Sinmun traveled in a royal procession to the underwater tomb of his father, King Munmu, to receive the Silla treasure of a jade belt (玉帶) and a bamboo flute called Manpasikjeok (萬波息笛), objects that were intended to ensure the peace and safety of the nation. Among the many spots along the trail, this village of Mochagol happens to be at the beginning, explaining how the village got its name. Actually, generations earlier, the name of the village was ‘Machagol,’ which means ‘valley of horse-drawn wagons,’ but eventually the pronunciation changed to ‘Mochagol.’ The course that I took started right there at Mochagol and continued all the way to Girimsa Temple. 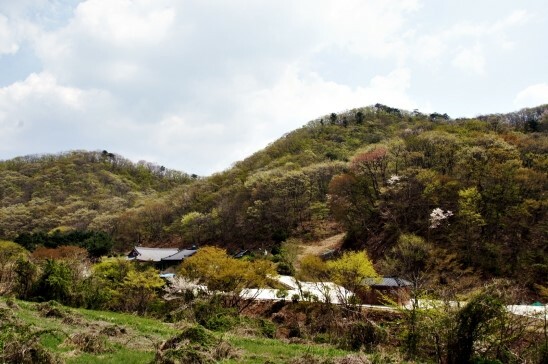 Mochagol is another name for the village of Chuwon, located just at the entrance to Churyeong Tunnel as you go towards coastal Gampo from downtown Gyeongju. 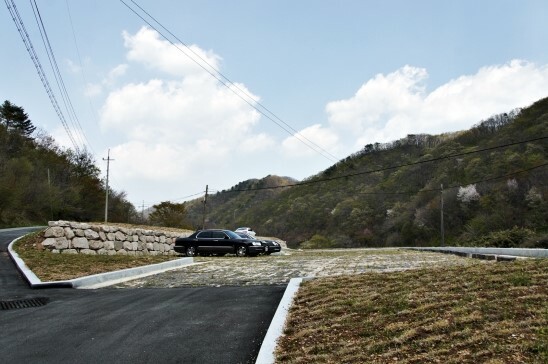 I left my car in the community center parking lot in Mochagol (Chuwon village) and walked about thirty minutes before reaching the signboard for the trail. Just beyond the community center, there is actually a fairly spacious parking lot. So, if you’re going by car, you can drive a bit further than I did. A one-lane concrete road has been laid there. 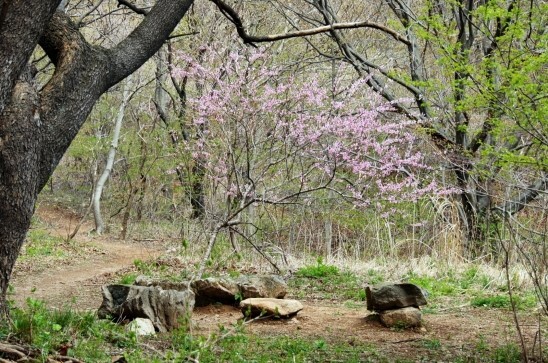 If you know some background about the Royal Procession Route of King Sinmun, the trail becomes more meaningful to walk on. 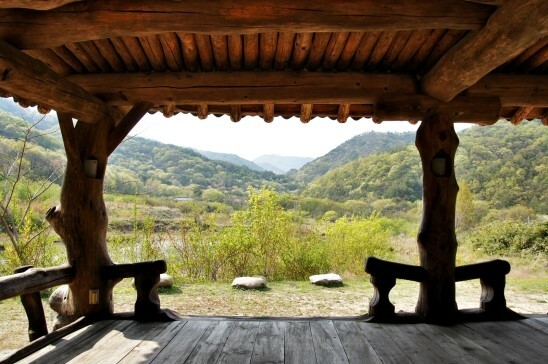 “Since way back in the Silla dynasty, all the way through the late Joseon era, this route used to link Gyeongju with the coastal areas of Gampo and Janggi. This road connected people and culture. But it was also the main route for marauding Japanese invaders. So, many stories about this road have been handed down. 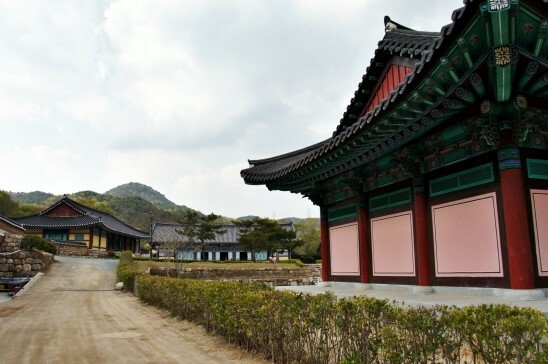 Notably, this was the route followed by Seok Talhae, the prince of the small Yongseong-guk kingdom, when he infiltrated Silla. It was also the funeral procession route for King Munmu, the ruler who unified ancient Korea’s Three Kingdoms. And it was the route along which King Munmu’s son, Sinmun, traveled in a procession to receive a precious treasure from his late father, who had become a dragon. This legendary Silla treasure consisted of a jade belt (玉帶) and a bamboo flute called Manpasikjeok (萬波息笛). The Procession Route follows the course described below. The total distance, one way, is a little over four kilometers. It’s an easy hiking course that goes from one valley to the next as they crop up here and there along the course. 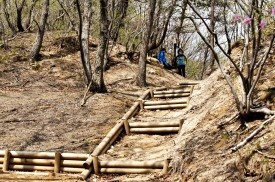 The section after Suret Pass has a fairly substantial slope until you reach Yongyeon Waterfall. For me, going from Mochagol to Girimsa Temple took about two and a half hours, one way. If you plan to hike there and back again, a rough estimate would be about five hours for the round-trip hike. Long, long ago, horses trotted along this path, drawing the royal carriage. However, with the passage of time and history, the path has become an unassuming trail through ravines and valleys, only wide enough for one or two people to pass. As I follow the trail along a hillside in the unspoiled village of Mochagol, I try to imagine the past glory of this royal procession route. Because of nature’s dramatic makeover across the centuries, what we need now is the power of imagination. Informational signboards are posted here and there along the trail, providing fodder for the imagination. You can learn the story of the nation’s guardian, King Munmu, whose aspiration was to become a dragon in the East Sea to protect the country; the story of a bamboo flute called Manpasikjeok (萬波息笛 - flute that calms ten thousand waves), which could rid the world of turmoil and bring peace, according to legend; and even the fascinating story of the natural ecosystem in the woods of Mount Hamweolsan. I recommend taking your time as you walk, so you can have a good look at all the signage along the trail. 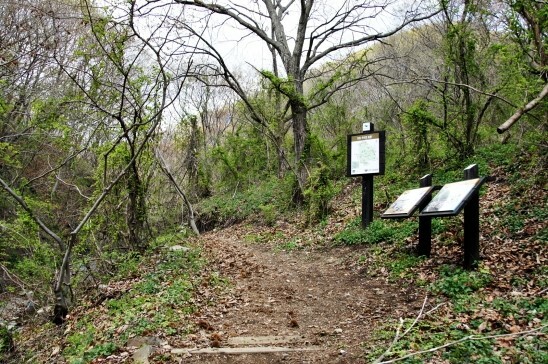 Certain spots on this section of the trail require some caution, as they run along ravines and creekbeds, crossing streams and passing through some swampy areas. That’s why a certain amount of maintenance is performed on this trail. 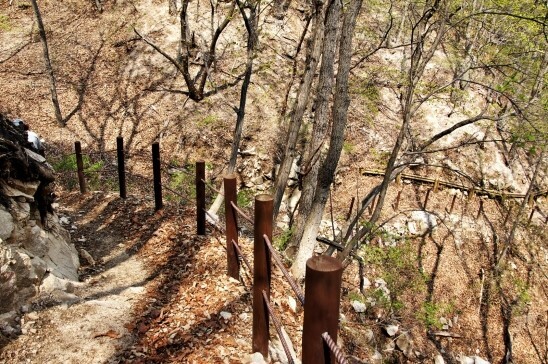 But it seems minimal infrastructure has been introduced, allowing the pristine nature of the trail to be preserved. Besides the wooden bridges required to cross the wider streams, a few stepping stones are all you need to get across the water. And instead of benches, you can sit and rest on wide rock slabs or flat boulders. 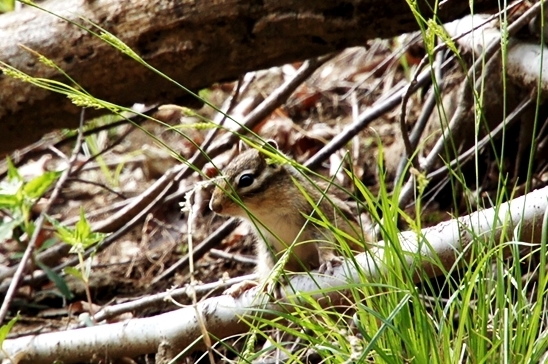 Since it’s a secluded trail with rather infrequent human visitors, the chipmunks are pretty fearless. Instead of being timid, they approach close enough to show their cute faces with curious expressions, wondering, ‘Who are these creatures, and what are they doing?’ Shake off your human scent for a moment and try wrapping yourself in the scent of grass, and let your human-ness flow away in a babbling brook. The vibrant beauty of the wildflowers adds greatly to the pleasures of the trail. I’ve been waiting to see the procession route of King Sinmun for such a long time, but going there in the spring made the long wait worthwhile. At Suret Pass, where wagons used to enter the trail (a “su-re” was a horse-drawn wagon or cart), I stopped to rest. While taking stock of the trail I had walked so far and the next leg of the journey, I encountered hikers coming from the opposite direction. As they were the first humans I had seen in a while, I gave them a hearty greeting. From Suret Pass, the trail starts to slope. If you’re heading towards Girimsa Temple from the direction of Mochagol, it’s a downward slope, making for a less difficult hike. But on the way back, be prepared for an uphill hike. The expression ‘over the river and through the woods’ is an apt description for this section of the Procession Route of King Sinmun. 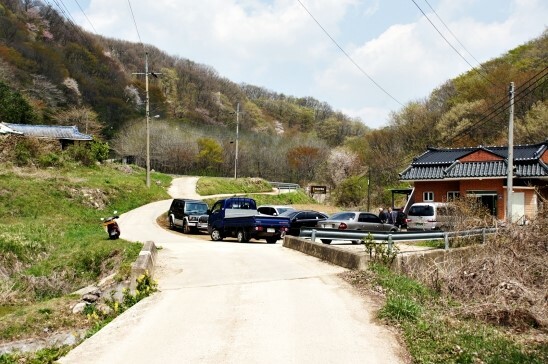 I almost went right past Sesu-bang, which is located on the other side of Suret Pass, before you reach Yongyeon Waterfall. Fortunately, I spotted the signboard just off the trail before I had gone too far. “Sesu” means “washing hands,” and legend holds that ‘Sesu-bang’ got its name because King Sinmun washed his hands here while taking a rest during the processional journey. 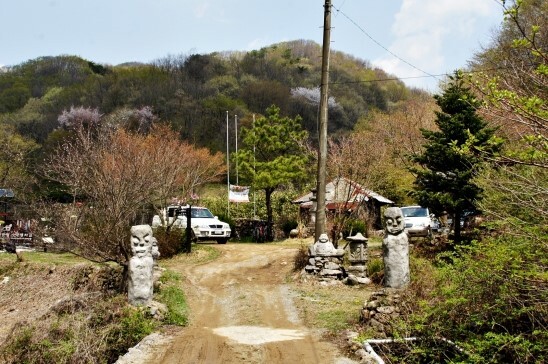 When you’ve gone past Bulyeong Pass, you have covered more than two-thirds of the course. 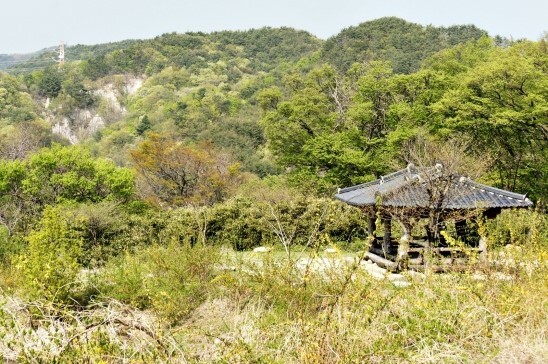 Bulyeong Pass is the site of an engraved notice from the reign of King Sunjo of Joseon, inscribed with a royal decree prohibiting entrance to the mountain. 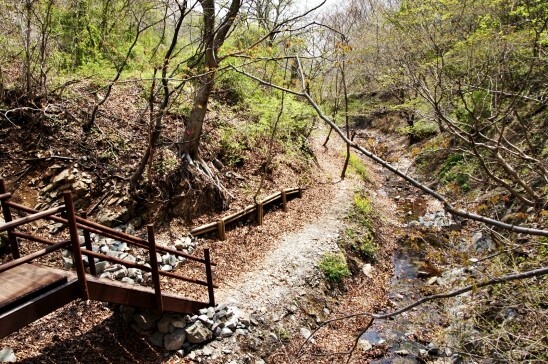 On the way to Yongyeon Waterfall, the terminus of the course, I encountered a fork in the trail. 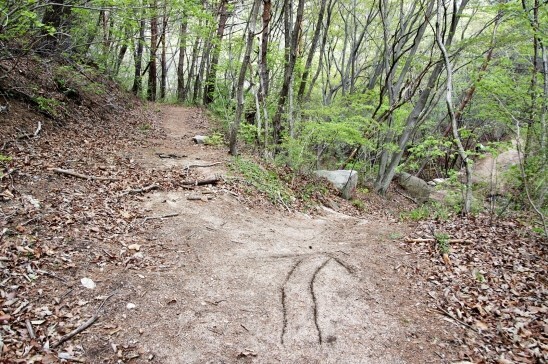 A previous hiker had marked the trail with an arrow drawn on the ground. 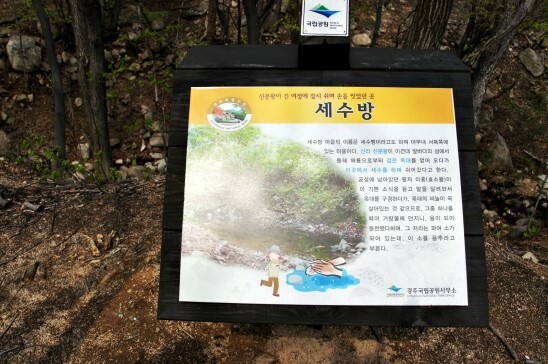 I followed the arrow to the right and continued walking towards Yongyeon Waterfall, where legend says that part of the jade belt turned into a dragon and ascended into the sky. 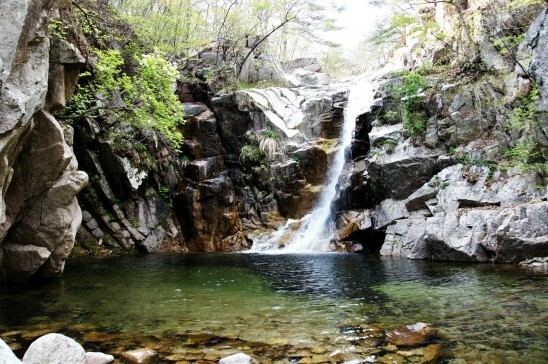 Around the time I was getting weary from the long walk, I came to Yongyeon Waterfall, one of Gyeongju’s secret gems. I had no inkling this waterfall was here. 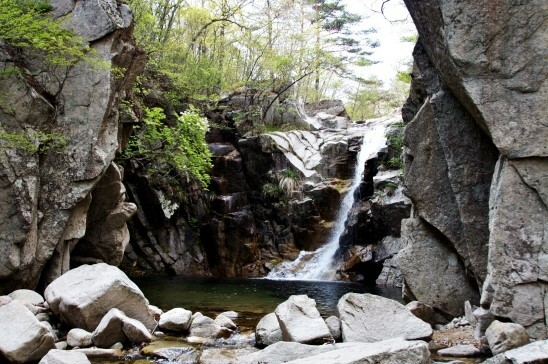 I was amazed yet again when I realized that I had actually seen this waterfall once on TV, without knowing it was right here in Gyeongju. I remember marveling at the scenery on TV and wondering where it was. In 2012, Park Chan-wook and his brother Park Chan-kyong made a short film called “Cheongchul-eoram” (“Day Trip”). It tells the story of a gray-haired master and a young girl who communicate through the narrative music form of pansori. The film project was produced to mark the 40th anniversary of Kolon Sport, the sporting goods company. I caught a promotional segment about it on TV, featuring a shortened version of the film. 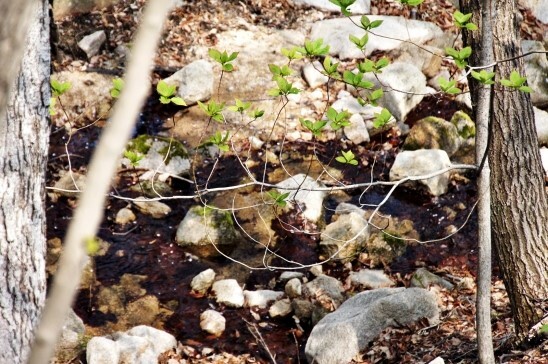 Anyhow, this short film was set in Gyeongju, and the film’s poster shows Yongyeon Waterfall as the background image. As King Sinmun was returning from his father’s Underwater Tomb, carrying the precious jade belt and bamboo flute he had received from the dragon of the East Sea, his party stopped by in this area. He placed one fragment of the jade belt into the water, where it was transformed into a dragon. The dragon then ascended into the sky, leaving behind a waterfall. 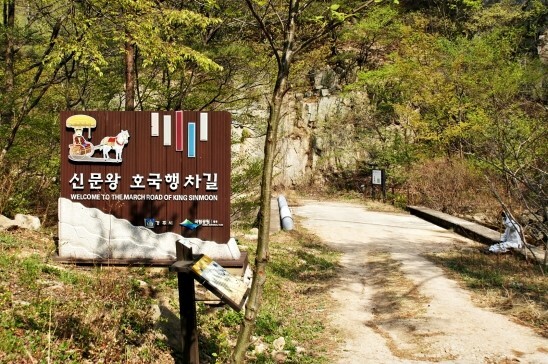 A signboard identical to the one I saw at the trail’s starting point (reading ‘Welcome to the March Road of King Sinmoon’) stands at a spot near Yongyeon Waterfall. This is the end of the trail, officially. If you are ready to go back to Mochagol, this would be a suitable turning point to retrace your steps back to the beginning. Since I planned to continue hiking all the way to Girimsa Temple, I kept going past the signboard. You can reach the entrance to Girimsa Temple by following the trail next to the temple. At Girimsa Temple, I wrapped up my journey with some deep breathing. 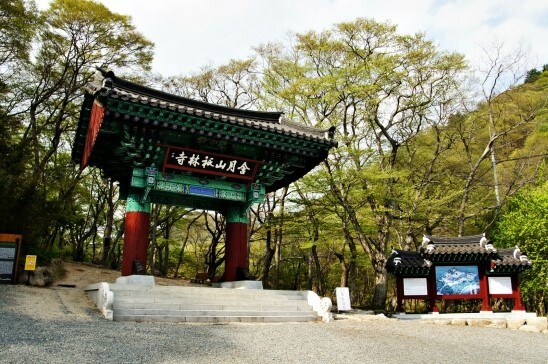 Take a walk through the secluded woods of Mount Hamweolsan, recreating the royal procession of King Sinmun in your imagination. 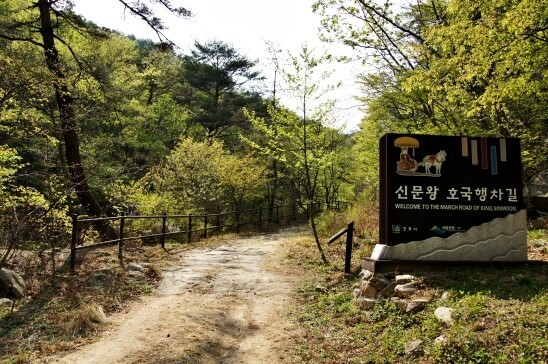 To get to the starting point of the Royal Procession Route in Chuwon Village (Mochago), go left just before Churyeong Tunnel. Leave your car at a parking area just past the village, and then walk a bit further to reach the trail. By bus: Take Bus No. 100 or 150 towards Gampo, and get off at the Chuwon Village stop.